I love living near the water and mountains in Los Angeles, but it's a far cry from being in the unspoiled wilderness. One of my goals after hiking in the Santa Monica mountains is to try and keep the outdoor serenity I experience until I at least get out of the parking lot and hit PCH. The great things about California though, is if you continue up PCH for just a little while, you'll find yourself in a totally different environment. I decided to do just this after spending a weekend with my brother and his family in Northern California. Point Reyes in West Marin is only about an hour north of the Golden Gate bridge, but what a difference an hour can make. Highway 1 in these parts include 80 miles of untouched coastline. Small two lane roads twist and turn revealing one gorgeous view after the next. The most remarkable part was the lack of development. It was open land in all directions. I figured the best way to dive into the surroundings was to abandon the car and get on foot in the mountains. The Point Reyes National Seashore has 150 miles of trails to allow you to leave the city life behind. My sister in law and I enjoyed the vigorous climb up the Sky Trail in a warm, light mist through thick patches of enormous moss covered trees. Clearings made larger forests of trees visible, as well as a cloud covered shoreline. We felt so small next to the thick, vast collection of green. There was nothing but stillness to take in. We worked up an appetite after hiking, so made the quick drive into Point Reyes Station and had lunch at the butcher shop/cafe Marin Sun Farms. A lot of places are closed Monday and Tuesday, so take note of times, but try and time your visit to eat at this excellent restaurant. 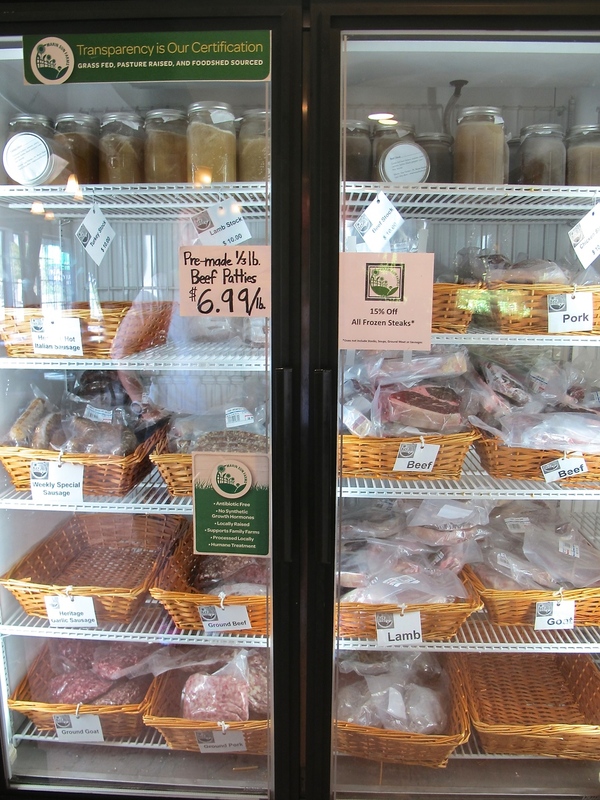 Marin Sun Farms uses all grass fed, pasture raised meat and poultry. They sell their product online, at farmers' markets and at their great shop in Point Reyes Station. We decided to veer off the beaten beef path and get a goat burger, which is a little gamier, but the chèvre, mushrooms and caramelized onion brought great sweetness and flavor. Sure you can get french fries, but we opted for the "sweet root" fries which is a bunch of root vegetables cooked in pork lard. Yeah, you want those. They're vegetables! You'll want to save room for the water buffalo ice cream and gelato for no other reason except that you've likely never said those words together. The plain water buffalo milk ice cream was so rich and creamy. It needed no topping or extra flavor. Fantastic. 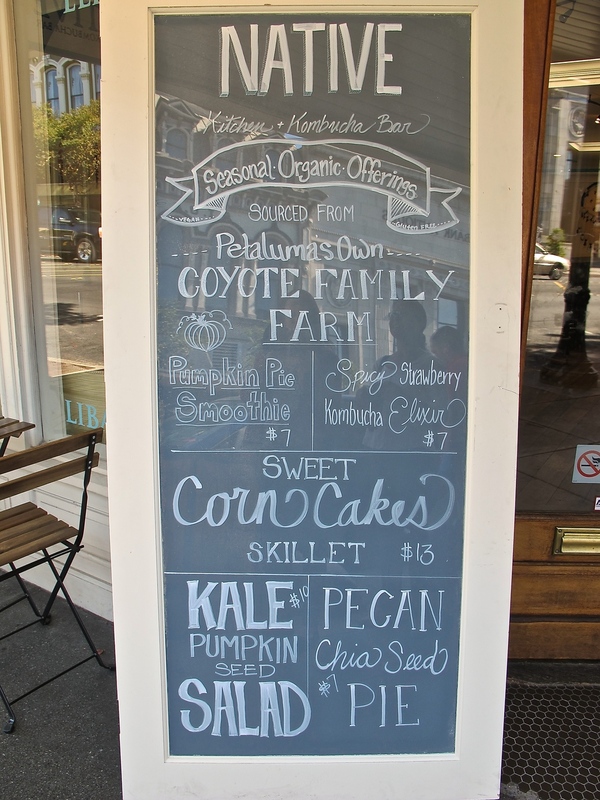 Point Reyes Station is a quaint little town filled with bakeries, markets and shops. There are some cute stores to poke into and browse for art, jewelry and clothes. Cowgirl Creamery has a storefront here as well in Tomales Bay Foods, and serves lunch on select days, but not the day we were there. Toby's is a fun stop with gourmet products, crafts and even art - all in one place. If you're on the water in West Marin, then you're going to need to eat some oysters. Yes, need. They're catching them steps from the shore, so they're as fresh as you're going to get, unless you're one of the fishermen doing the catching. 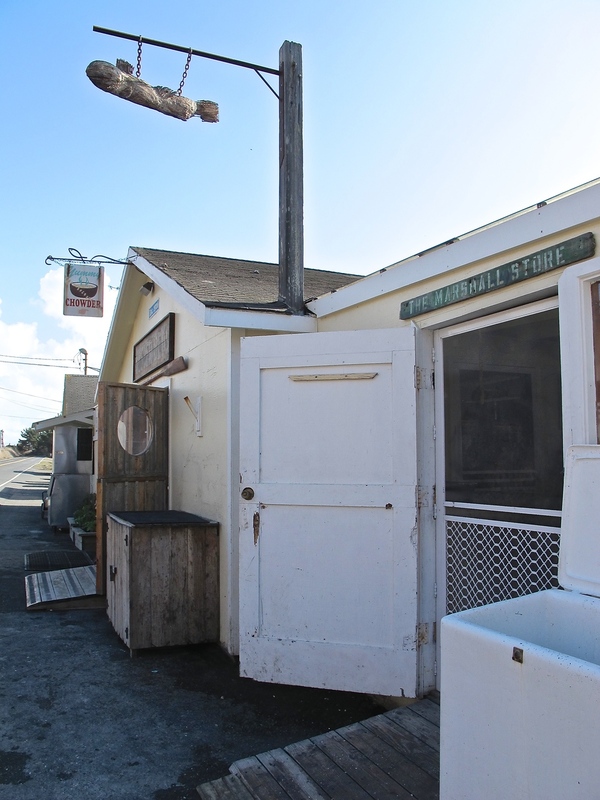 The Marshall Store is a great, unassuming spot that has one long communal wood table that sits just off the road, on the water. You go inside to order your oysters and can also get salads and chowder. They'll flip you an opener after choosing a bottle of crisp Chablis or Sancerre from the fridge. Half bottles and single beer are also on offer. The rest is up to you to sit and enjoy. We went as the sun was setting which was the perfect time. If you want more info on oysters, you can take a tour at Hog Island Oysters. They sell oysters in the shell, or already shucked and you can enjoy both on site at The Farm. I could have spent many more days exploring and just being by the beautiful open expanse in Marin, but all good things must come to an end. We broke up the transition to the big city with a stop in Petaluma on our way back. Petaluma is another charming town with Victorian houses, antique shops and lots of great buildings with ivy crawling up the sides. There is a river that runs through the back side of town, to enjoy another meal on the water. People rave about Dempsey's, but there are many cute, and progressive restaurants from which to choose. 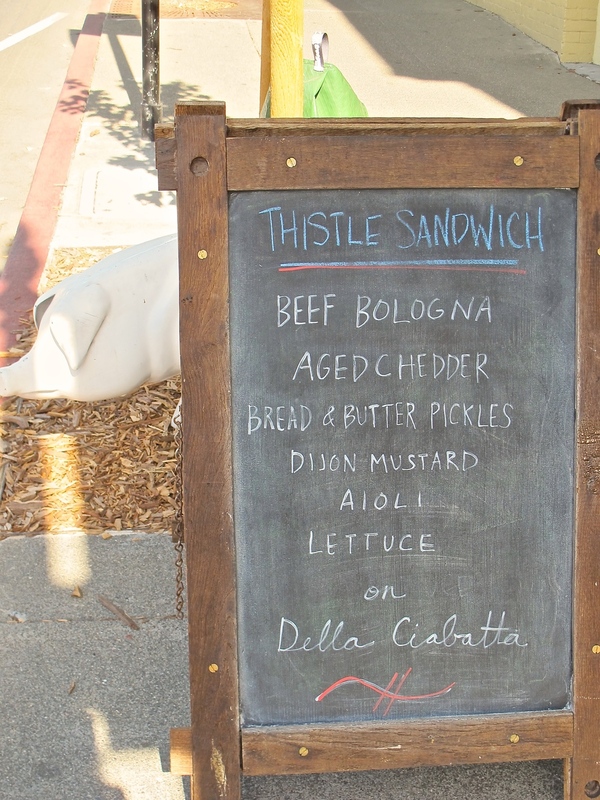 The beef bologna sandwich at the The Thistle is going to put your Oscar Mayer nightmares to rest. When you're ready for dessert, stop into Petaluma Creamery for some cheese to take home, or grab some freshly made ice cream like one of their seasonal apricot or pumpkin flavors. It's hard to top such a great getaway with beautiful backdrops, fresh air and great food, but it is in fact possible with the right accommodations. Click here to find out exactly where you need to stay in West Marin to make this trip even more perfect.